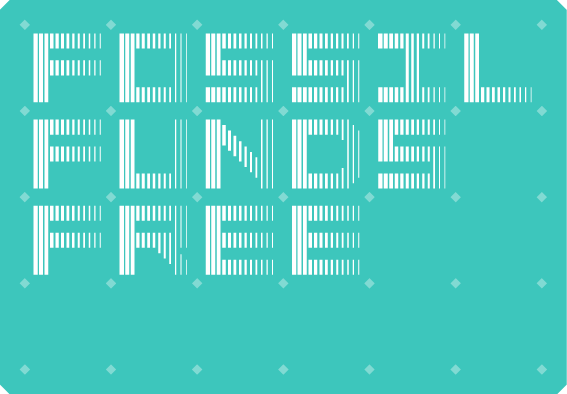 If you scroll to the bottom of the About page of the Creative Carbon Scotland website you’ll find the Fossil Funds Free logo, which shows that we’ve pledged not to accept any funding from fossil fuel companies. The full statement that we’ve signed reads, ‘We do not take any oil, coal, or gas corporate sponsorship for our cultural work. We call on our peers and institutional partners to refuse fossil fuel funding too.’ A no-brainer, you’d think, for an organisation working on the intersection between climate change and the arts. Well, yes. But nothing is ever that simple in the world of climate change. Let’s be clear first that it is of course that simple. If we are to limit the global temperature rise to 2°C, let alone the 1.5°C ambition, as the world’s nations agreed in Paris in December 2015, then, in the absence of some magical technology to take greenhouse gases out of the atmosphere (and they haven’t developed it yet to work on any significant scale), there is a limited amount of pollution we can put into the air. So it is simple. As the Governor of the Bank of England said, most of the fossil fuel reserves can’t be burned. But the fossil fuel companies, and the governments of the UK and Scotland, were thrilled last year when a new oil field was discovered 60 miles West of Shetland. And you can see why: the transition has human costs. In Aberdeen I sometimes stay in a nice B&B which used to be full of contract staff every week: now it’s like a ghost ship. Humans are addicted to energy: we can’t live without it (literally: evolutionary scientists think that it was the discovery that cooking food made it more digestible, and so enabled our brains to grow larger, that enabled homo sapiens to develop into the extraordinary success that we are today). The future, of Aberdeen and the world, is not a fossil fuel one. But the industry’s skills, knowledge, technology and facilities are closely related to those needed for the large-scale, difficult environment renewables that will feed humans’ insatiable appetite for energy. On the financial side, a UN report estimates that the cumulative global investment required in renewable energy to stabilise atmospheric CO2 concentrations at 450ppm (which wouldn’t keep us below 1.5°) ranges from US$149 billion to $718 billion per year for the decade 2021-2030. It may be depressing, but the energy companies are some of the only organisations able to invest that sort of money. So what’s a poor arts manager to do? I’m conflicted about sponsorship anyway. The arts have always been supported by patronage, religion and, more recently, governments, so I’m not vehemently opposed. But I’ve worked in the arts for over 30 years and because I’ve never led a mainstream organisation doing predictable work (I’ve done a lot of newer work, my happy days freelancing at Pitlochry being the main exception, but there I had nothing to do with the money), any sponsorship that has been available has been pretty minor: it’s the mostly big organisations presenting work that they can confidently describe as unthreatening to the sponsors that get the big cash, especially from larger companies such as energy giants. Let’s not kid ourselves: sponsorship isn’t a replacement for public funding for much of the arts, which is there precisely to address market failure. Unlike charitable donations, sponsorship is a business transaction. The arts get the money, the company gets a benefit: credibility, tickets for guests, their name on the bus stops on the high street and positive associations in their customers’ (or the Government’s, or their peers’) minds. So it isn’t just a warm glow that’s being offered. The risks to a cultural organisation of taking dirty cash are many. Public awareness of both climate change and the dodgy nature of some money is growing fast – look at the impact of David Attenborough’s Blue Planet on companies’ use of plastic and the ‘Presidents Club’ furore. So there’s a definite reputational risk, with the added danger that Liberate Tate’s own work might outshine your own! It might make your organisation more risk-averse: you’re now beholden to that sponsor, and if you’re on reduced funding from other sources (perhaps because you’re so good at getting sponsors!) then loss of them might mean redundancies, a thinner programme… Other funders could pull out, either because you don’t now meet their own ethical standards, or because they fear being tainted by association with your sponsor. And how does it look to your main funder, who insists on your having a strong environmental policy and actions? I can’t say we face this problem at Creative Carbon Scotland – big fossil fuel sponsors aren’t exactly breaking our doors down. But perhaps we do need to engage with the fossil fuel people. We can organise events where artists discuss the future, but the engineers, geologists, finance people etc are also part of that future and many of them share those same concerns about making it a sustainable one. We may not take money from the energy giants, but I don’t think we can ignore them. Questions of ethics and choice when it comes to how the arts are funded by sponsors (whether that be historic private patrons or more modern corporates) are not new. But in our physically, socially, legally changing world, they are ever-more prominent. There is much evidence to show that the transition to a fossil fuel free future is underway. The oil and gas companies are going to be with us for some time, since we haven’t yet got to the stage where we can do without fossil fuels. But as discussed above, this ‘some time’ needs to be a limited one. And their persistence must not be based on how well they sell themselves and how they persuade people of their importance. Often, they seek to do this through our culture: our arts events and experiences.